<?xml version="1.0" encoding="UTF-8"> NutriShield All Natural DEET Free Insect Repellent Works Great! If you have been reading my blog the past couple of weeks, you know I have been writing about different insect repellents I have been trying in an effort to find one without DEET that works. The Bug Off wrist bands I tried didn't work and neither did the BugPatch All Natural Insect Repellent Patches I tried, two readily available products. I was sad to have to write about how they failed because I really wanted them to work. I am so sick of having to practically take a bath in DEET based insect repellents to avoid getting bit while camping. Although reports of toxic effects from using DEET have been rare, I personally don't believe that using chemicals on your skin isn't bad. For me it's always been a trade-off between getting bit and worries about possibly getting West Nile Virus from a mosquito or taking my chances with DEET not causing me to grow an extra finger or giving me cancer. But, I guess the saying of "The Third Time's The Charm" is true, because the third product I tried, Nutri Shield Insect Repellent, worked great! I found it at Gander Mountain when I was looking for a small dutch oven. 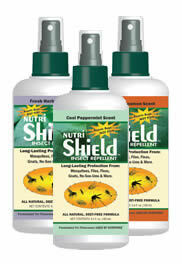 Nutri Shield Insect Repellent is DEET free and 100 percent natural. There were 2 formulas available at Gander Mountain, an herbal blend and a peppermint blend. I chose the peppermint. I used it over Labor Day weekend while visiting family at a campground that was loaded with trees and bugs. I put it on immediately after getting my first mosquito bite and I'm glad to say that is the only mosquito bite I got all day and I was at the campground until 9:30 pm. That's saying a lot because I am our family's "advance warning system" for mosquitoes. I am ALWAYS the first one bit. I had other family members try it as well when they started to get bit and they didn't get any more bites either. Plus, the stuff smells really good - like peppermint candy! I'd rather smell like candy versus chemicals any day! The good news is that it works. The downside is that it may be a little tricky to find. Nutri Shield's company president, Mike Tinghitella, told me it's available at Gander Mountain, Bass Pro Shops, and Joe's Sports (GI Joes), plus at independent stores, but is not currently in their online catalogs. Mike is hoping to have online vendors soon. When Nutri Shield is available online I'll update this post with a link. In the meantime if anyone finds it at a local store or finds a place to purchase it online, please post that information in the comments section below. Besides the peppermint scent (peppermint and garlic - and no, it doesn't smell like garlic at all), there is an herbal scent (garlic, peppermint and lemongrass) and a cinnamon scent although Mike said the cinnamon scent is going to be discontinued because it isn't quite as effective as the peppermint and herbal scents, plus it can cause irritation to sensitive skin. Personally I recommend the peppermint scent because it's the one I tried and the one that I know works. To learn more about Nutri Shield, visit their website at NutriTekInc.com . The website may seem a little confusing at first (it did to me) because it has pages that talk about different formulas but Nutri-Tek's president, Mike Tinghitella, said the information is categorized that way because Nutri Shield, besides appealing to people who want a natural product, it also has a big appeal to outdoorsmen - especially fishermen (and fisherwomen) because it can be sprayed on fishing lures to increase the bite (so if you fish you now have 2 reasons to try Nutri Shield)!